Tri-plot is a Microsoft® Excel spreadsheet for the preparation of triangular (ternary) diagrams for particle-shape and tri-variate data. 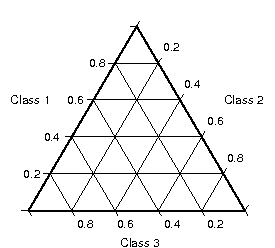 Conventional triangular diagrams are used to represent tri-variate data in which the three variables represent proportions of a whole (Fig. 1). In the Earth Sciences, a common application is the representation of the proportions of sand, silt and clay in a sample. Numerous software packages are available for the production of such diagrams. An alternative type of triangular diagram was proposed by Sneed & Folk (1958) for the representation of particle shape (Fig. 2). 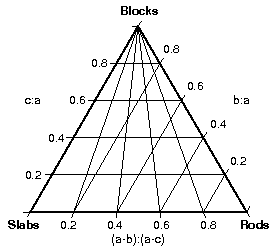 This scaling of the triangular diagram may also be used to represent sedimentary fabric shape (Benn 1994) and has potential application wherever the relationships between three independent variables are compared. Existing software is unable to plot these diagrams as the parameters on the three axes do not sum to 1. Figure 2: The Sneed & Folk triangular diagram. Tri-plot provides a simple method of producing both conventional and Sneed & Folk triangular diagrams. Because Tri-plot is implemented in Microsoft® Excel, it has a familiar user interface and data can be easily cut-and-pasted into it. The latest version (1.3) supports the plotting of the Sneed & Folk (1958) shape classes and user-defined isolines of the oblate-prolate (Dobkins & Folk 1970) and maximum-projection sphericity (Sneed & Folk 1958) indices. Tri-plot is made available free of charge subject to the condition that the original source (Graham and Midgley 2000) is referenced in all publications which utilise it. Tri-plot, and all associated documentation, is copyright © 2003 David Graham and Nicholas Midgley. Users are free to distribute and modify the software provided that the original source and copyright are acknowledged in any modified version and that no attempt is made to pass off the derivative work as being the unmodified work of David Graham and Nicholas Midgley. The developers of Tri-plot make no warranty regarding (1) the suitability of Tri-plot for any particular application, or (2) the absence of errors in the software or documentation. To the extent permitted by law, no liability will be accepted for any losses whatsoever resulting directly or indirectly from the use of Tri-plot or the associated documentation. Users should satisfy themselves as to the suitability of Tri-plot for their intended application. The original version of Tri-plot (as described in Graham & Midgley 2000) is available from the Earth Surface Processes and Landforms resources page on the Wiley Interscience website (http://www3.interscience.wiley.com/cgi-bin/jabout/2388/OtherResources.html). Before downloading, please ensure you have read and agree to the conditions of use outlined above. Tri-plot Excel workbook. Requires Excel. Tri-plot documentation. Includes Graham & Midgley (2000). The paper that describes the original version of Tri-plot. WinZipped file containing all of the above files. Requires WinZip (or equivalent). Tri-plot was developed whilst the authors were in receipt of studentships from the University of Wales, Aberystwyth (David Graham) and Liverpool John Moores University (Nicholas Midgley). Benn DI. 1994. Fabric shape and the interpretation of sedimentary fabric data. Journal of Sedimentary Research A64(4): 910-915. Graham DJ and Midgley NG. 2000. Graphical representation of particle shape using triangular diagrams: an Excel spreadsheet method. Earth Surface Processes and Landforms 25(13): 1473-1477. Sneed ED and Folk RL. 1958. Pebbles in the lower Colorado River, Texas, a study in particle morphogenesis, Journal of Geology 66(2): 114-150.